Dogs in Great Smoky Mountains National Parks? It might not be the best idea. We took our dog, Chloe, on our recent trip to Great Smoky Mountains National Park — just like we do on all of our camping adventures. Chloe is a great camper. She doesn’t bark at other campers (very much), she sleeps well in her crate in our tent and doesn’t bark at night. You can just see that she is in doggy heaven. So taking her to Great Smoky Mountains National Park was a no-brainer. Before heading out I did a little research about having her in the park. The park’s website noted that dogs are not allowed on any of the trails in the park. We took her anyway. What I failed to do was to think through exactly what not being able to take her on any trails would mean for our trip and for how much we could enjoy the park as a whole. In short: not being able to take the dog on trails made enjoying the trip hard. 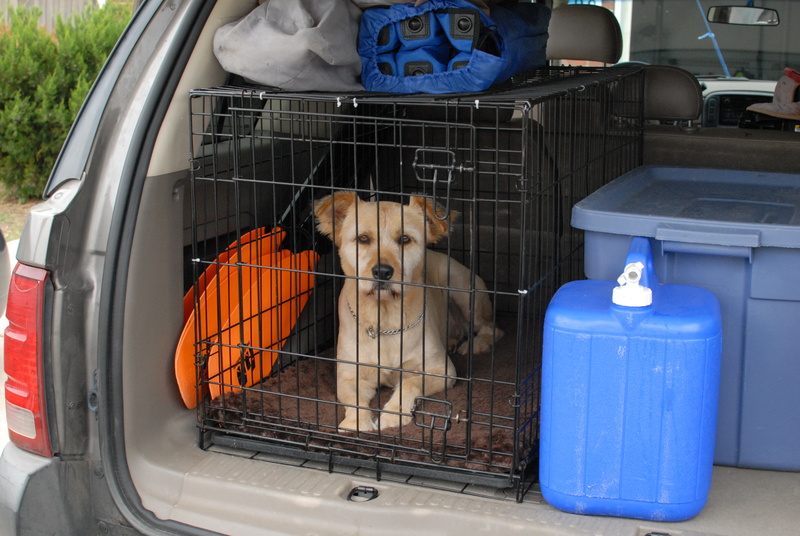 We could’ve left her crated in the back of the Explorer while we hiked. But honestly? Knowing that she was back there alone made me not want to hike. I didn’t like knowing that she was crammed in the back of the car while we were out enjoying the trails. Fortunately my children are on the young side for hiking — the youngest is 2.5-years-old. Our hikes are short and sweet, so any leaving Chloe behind that we did was brief. Also, I confess: we broke the rules and took her on some trails, including a short waterfall hike and a nature hike out of the campground at Cades Cove. I’d rather feel guilty about that than guilty about leaving her behind. Still, would I take my dog back to Great Smoky Mountains National Park knowing what I know now? Probably not. Instead I would probably find someone here at home to keep an eye on her so we can enjoy our hikes free from the guilt of bringing her or leaving her behind.